It’s wacky and fun! It’s illustrated and easy to read! It’s a whole new twist on learning! And it’s FOR (curious) KIDS ONLY--boys, girls, kids who like to read, kids who don’t…even grown up kids. Go ahead, be curious! 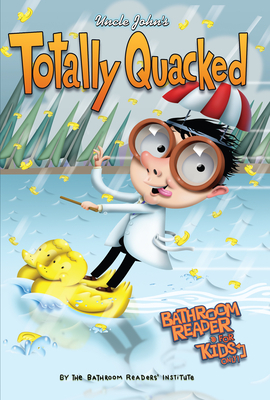 Inside Uncle John’s Totally Quacked Bathroom Reader you’ll find 288 pages packed with strange science, weird news, obscure history, odd sports, and the interesting origins of everyday things. Special to this edition: amazing animal quack-ups, history’s biggest quacks, ducky weather, fine feathered friends, quacky fashion, and things that are “Just Ducky” (which could mean really good or…soaking wet). And that’s not all! Uncle John’s Totally Quacked Bathroom Reader includes story lengths to fit any attention span (or accommodate any duration of Throne Time)--“short” (one page), “medium” (two pages), and “long” (three to five pages)--and they’re all fun, informative, and educational. Warning: Reading this book may make you smarter than your friends!